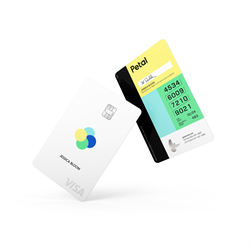 Credit card startup Petal is partnering with WebBank to issue its Petal Visa credit card nationwide this year. Petal, a startup working to make safe and affordable credit more accessible, today announced it is partnering with WebBank to issue the Petal Visa credit card to customers nationwide, starting this year. WebBank, member FDIC, is the bank partner for many of the leading financial technology businesses in the U.S.
Petal is a simple, no-fee credit card paired with a mobile app, that together, make it easy for people to build credit, track spending and manage money responsibly, even if they’ve never had credit before and don’t have a credit score. Petal has no fees (whatsoever), low interest rates (14.24%- 25.24% APR variable based on the Prime Rate as of March 21, 2018), and high credit limits (up to $10,000) as compared with leading introductory credit cards--significantly better terms than most other cards available to people just starting out in credit. In September, Petal began beta-testing the card, and opened up a waitlist where interested consumers could sign up to receive an early invitation to apply. Since then, more than 60,000 people have joined the waitlist at petalcard.com. Petal is tackling one of the credit industry’s most intractable problems: because traditional credit scoring relies heavily on borrowing history, it may underestimate the creditworthiness of an entire generations of U.S. consumers, along with millions of others that have historically lacked access to financial services. With credit scores that are artificially low or non-existent, these consumers are often denied access to financial products or offered risky and expensive products that make it easy to get trapped in debt. Petal uses a new type of comprehensive credit analysis--Cashflow Underwriting--that yields a more precise and up-to-date picture of financial health. Petal measures additional components of each individual’s creditworthiness beyond information in a credit score, like how much they make, save and spend over time, and the bills they pay each month. This gives Petal a more accurate understanding of how much someone can safely afford to borrow and enables the company to identify people who are able to use Petal responsibly, even if they’ve never used credit before. With these capabilities, Petal is setting out to serve customers that most banks turn away, and offer them more competitive terms across the board: lower interest rates, higher credit limits and no fees whatsoever. To meet the needs of a diverse customer set, Petal offers a website and mobile application designed to help users manage their credit card responsibly. Petal leverages insights from behavioral science to support smart financial decisions, and employs clean, intuitive design to make credit simple and transparent. The app provides budgeting analysis, timely notifications, and guidance in making payments. Petal helps customers stay out of debt by suggesting that they pay the full balance each month, and—unlike other credit cards—never charging hidden fees or interest on purchases that aren’t yet due. If customers prefer to pay their balance over time, Petal shows them the cost of interest in dollars, rather than just APRs, so they can make fully-informed financial decisions. Today’s partnership comes weeks after Petal announced a $13 million Series A financing from Valar Ventures and Third Prime Capital, among others. WebBank is a leading national provider of online consumer and small business loans made in partnership with finance companies, OEMs, retailers and financial technology companies.